January 24, 1876: Glory! 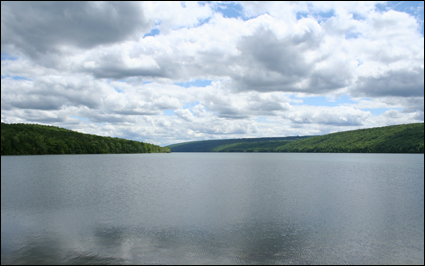 Hemlock Water at Last!“So proclaimed the [Rochester, NY] newspaper headline on January 24, 1876 as it announced the arrival of Hemlock Lake water into Mt. Hope Reservoir (today named Highland Reservoir). Finally, after more than three decades of political bickering and aborted construction attempts, Rochester had an abundant supply of pure wholesome drinking water. While an asset such as this may barely raise an eyebrow today, in 1876 this was truly a glorious event for the 70,000 citizens of Rochester. Hill, Henry W. 1920. “Water Supply: For Municipal, Domestic and Potable Purposes, Including Its Sources, Conservation, Purification and Distribution.” In The Encyclopedia Americana,39–65. This entry was posted in Year 7 TDIWH and tagged chlorine, drinking water, Edwin Chadwick, Hemlock, liquid chlorine, miasma, public health, Rochester, sewage, sewers, Vincent B. Nesfield, water, water history, water supply on January 24, 2019 by safedrinkingwaterdotcom. January 11, 1922: Two fascinating articles in Engineering and Contractingabout the progress of water treatment, regulations and disinfection in U.S. water supplies in 1922. 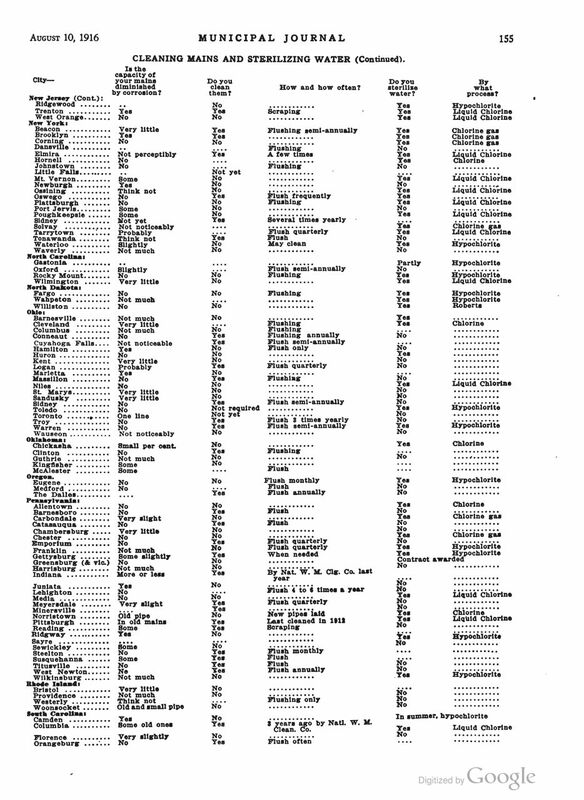 “The Chlorination of New England Water Supplies.” By William J. Orchard. 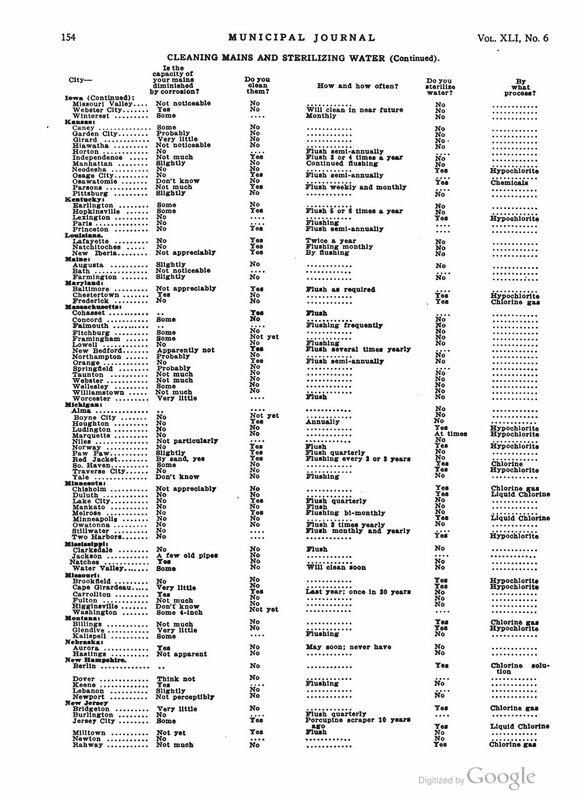 “One thousand nine hundred and ninety-six: communities In the United States chlorinate water or sewage or both with liquid chlorine. Only 128 or 6 per cent of these are in New England. Twelve are treating sewage, leaving but 116 New England communities chlorinating drinking water. 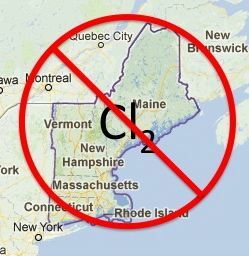 Nearly half, 43 per cent, of these are in Connecticut where 51 communities use liquid chlorine to safeguard their water supplies, 24 are in Maine, 16 are in New Hampshire, 11 in Rhode Island, Massachusetts has nine while Vermont has three communities using liquid chlorine for their water supplies. Scoring the states in this country in accordance with the number of communities using liquid chlorine and starting with New York in first place with 254, ending with Nevada in 48th place with but one lone chlorinating community we find Connecticut stands 11th, Maine 25th, New Hampshire 30th, Rhode Island 36th, Massachusetts 41st, and Vermont 47th. A manufacturer of chlorinating equipment naturally asks why this relatively small number of communities using liquid chlorine in certain sections of New England? Now, in trying to answer that question, the speaker appreciates that he is skating on thin ice-dangerously near a deep hole labeled ‘The Johnsonian Controversy,’ and caution dictates that he skate the other way. Commentary: I am not sure what “The Johnsonian Controversy” was but Orchard correctly points out the resistance to chlorination in New England. Antagonism against the use of chemicals in drinking water treatment was, in large part, due to the influence of the Lawrence Experiment Station on the actions of water plants. Engineering and Contractingarticle. “Some Features of Present Water Supply Practice.” Nicholas S. Hill, Chairman. “Water Quality Standards—Standards of quality are steadily rising and bid fair to continue doing so. Communities no longer consider safety sufficient, but demand a drinking water of good appearance. This demand has good scientific foundation for the best appearing waters are frequently the safer. In certain sections, the northeast particularly, waters having colors of 25 or more are still used without complaint. These colors would not be tolerated in western cities supplied with lake or filtered river water, or even in New England. Public opinion is fast getting in a position to demand water of an average color of 10 parts per million or less with a maximum of 15. Particular objection is made to colored surface waters containing odoriferous organisms and turbidity, whether due to heavy microscopic growths, to clay, or to iron rust, is also objectionable. Commentary: Only 14 years after chlorination began to eradicate waterborne disease, an enlightened public began to demand higher quality water—as they should. Reference: Engineering and Contracting. 1922. 57:2(January 11, 1922): 22-3. This entry was posted in Year 7 TDIWH and tagged B. coli, chemophobia, chlorination, color, drinking water, fear of chemicals, liquid chlorine, New England, public health, turbidity, water, water history, water quality on January 11, 2019 by safedrinkingwaterdotcom. October 24, 1879: Birth of Vincent B. Nesfield. Nesfield was the first person to use chlorine gas under pressure to disinfect drinking water. 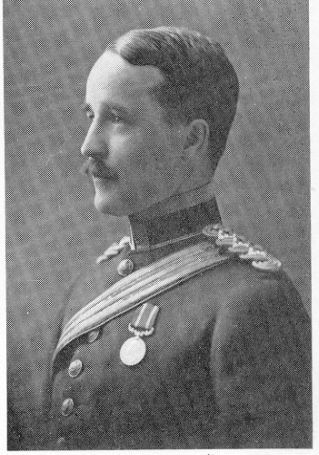 In 1903, Lieutenant Vincent B. Nesfield of the British Indian Medical Services published a remarkable paper in a British public health journal. 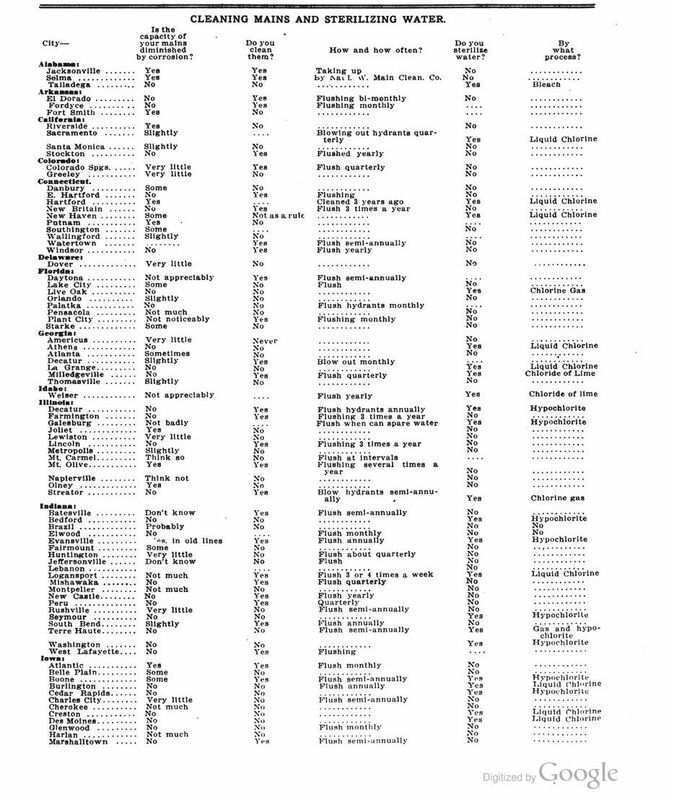 (Nesfield 1903) In the paper, he described his search for a chemical disinfectant to purify drinking water that would be suitable for use in the field as part of a military campaign. He came up with the idea of producing chlorine gas by electrolytic cells and then compressing the gas with 6 atmospheres of pressure until it liquefied which facilitated its storage in lead-lined steel tanks that held about 20 pounds of liquid chlorine. He treated 50 gallon batches of water by submerging the gas valve of the chlorine cylinder and opening it slightly to bubble the chlorine gas into the water. October 24, 1981: New York Times–Producing Fresh Water By Melting Icebergs. “Icebergs can be melted in such a way as to produce fresh water and mechanical energy. The proposed operation is described in a patent awarded this week to three employees of the Department of Agriculture Research Center, Berkeley, Calif. The procedure, as outlined by Wayne M. Camirand, John M. Randall and Earl Hautala in patent 4,295,333, starts with evaporating warm surface water by pumping it into a vacuum. The vapor produces electrical energy by operating a turbine. The vapor is then condensed by cold water from the iceberg, and the mixture is used to melt the iceberg itself. 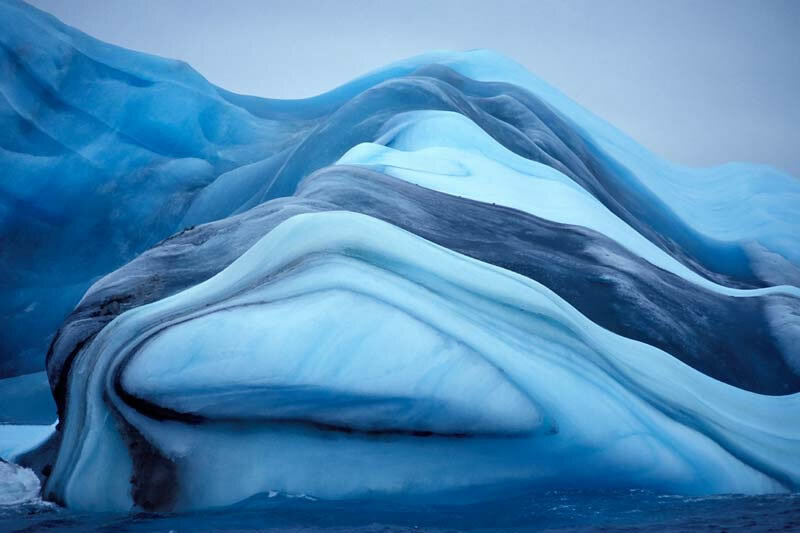 The added moisture from the vapor creates a volume of fresh water larger than that produced by melting the iceberg alone. Commentary:I am taking bets on whether or not this patent was ever commercialized. Had they known, all the three gents had to do is wait 30 years for climate change to melt icebergs for them. Is this where the phrase “patently absurd” comes from? October 24, 1632: Birthday of Antonie van Leeuwenhoek. Throughout the history of scientific improvement, the development of the tools for scientists helped incremental increases in knowledge as well as allowing them to break new barriers and make discoveries that would otherwise not have been possible. Such is the case for the invention of and improvement to the microscope. Lenses that magnified things were around for hundreds of years. Others had assembled multiple lenses in tubes and created the compound microscope. But it was not until the 17th century that a big leap was made. Antonie van Leeuwenhoek was born in 1632 in Delft of what is now called the Netherlands. In the same year, Galileo published his famous work Dialogue in which he argued that Copernicus was right—the sun was the center of our solar system. To put it mildly, science was in its infancy. The Catholic Church rewarded Galileo for his insight by declaring him heretic and holding him under house arrest for the rest of his life. There are many descriptions of van Leeuwenhoek’s life but the most entertaining is the lyrical narrative by Paul de Kruif in his classic book Microbe Hunters. De Kruif described van Leeuwenhoek as a janitor and shopkeeper, and, indeed, he was. However, van Leeuwenhoek was also obsessed with grinding lenses, making better microscopes and viewing the, as yet, unviewed microbial world. While looking around his house for common items to study with his inventions, he decided to look at drops of water and discovered that there were “beasties” swimming around. 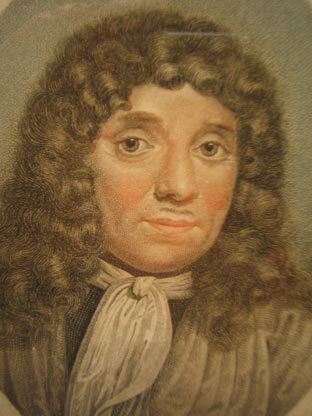 After a significant amount of time, which he used to perfect his tool and hone his descriptions of the microbial world, van Leeuwenhoek began corresponding with the Royal Society in London. Despite initial skepticism, the Royal Society elected him to their august body. Van Leeuwenhoek did not share well with others and preferred to keep his improvements to the microscope to himself. 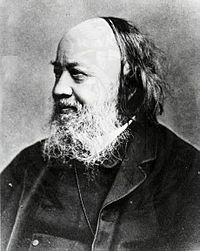 He did share his many discoveries in hundreds of letters to the Royal Society including many descriptions of bacteria. He was the first person to make these observations. After van Leeuwenhoek, others improved the microscope including Joseph Lister’s father, Joseph Jackson Lister. In 1832, the elder Lister was able, through manipulation of the lenses in the tube, to eliminate the “chromatic effect” or light halos around the object being observed. Thus, a relatively sophisticated tool was available for Pasteur to view his yeasts, bacteria and other microbes. De Kruif, Paul. Microbe Hunters. New York:Harcourt, 1996. Godlee, Rickman J. Lord Lister. Second edition, London:MacMillan, 1918. This entry was posted in Year 7 TDIWH and tagged chlorine, drinking water, icebergs, liquid chlorine, microscope, patent, public health, van Leeuwenhoek, Vincent B. Nesfield, water, water history on October 24, 2018 by safedrinkingwaterdotcom. August 10, 1916: Municipal Journalarticle. Sterilizing Water and Cleaning Mains. 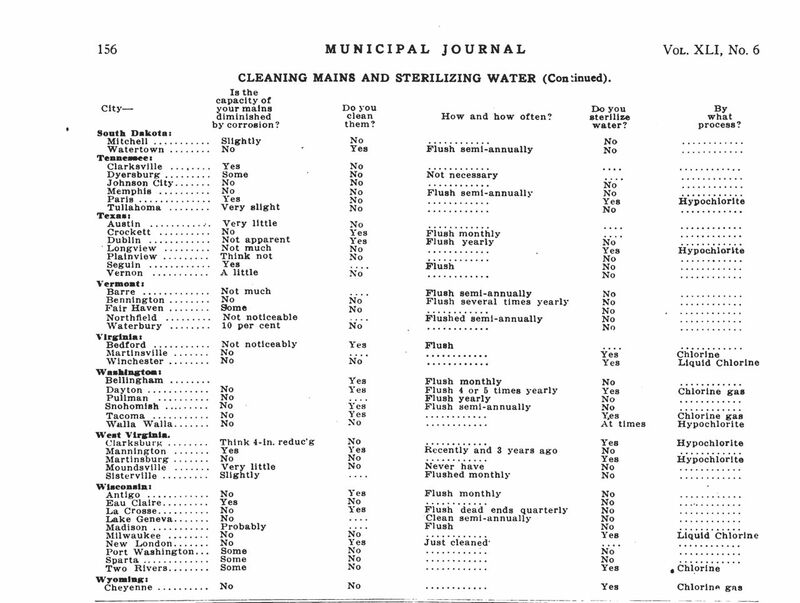 “In connection with the information concerning their water works furnished by more than six hundred officials and published in our June 1st issue, these officials also answered the questions: “Is the capacity of your mains diminished by corrosion?” “Do you clean them?” “If so, how and how often?” “Do you sterilize the water?” “If so, by what process?” Their answers are given in the table on the following pages. These answers are given as furnished, and no attempt made to change them with a view to uniformity. For instance, some report sterilizing by “liquid chlorine,” others by “chlorine gas,” and some by “chlorine”; but we suppose that all refer to the same treatment. Also “hypochlorite,” “chloride of lime” and “bleach,” all probably refer to the same material. In the answers concerning cleaning mains, quite a number report doing this by flushing or blowing out. This is generally believed to remove only sediment deposited in the mains, mostly that brought into them by the water, and to have no effect upon tuberculation or corrosion. A few, however, report “cleaning,” which refers in probably all cases to the actual removal by some application of force of tuberculation or other incrustation on the pipes. Commentary: Disinfection information in this article is fascinating on several levels. First, we see details of which cities were actually disinfecting their water supplies (and those that were not). We also read that there was STILL a fear of chemicals in drinking water even after the overwhelming evidence that typhoid fever and diarrheal diseases could be stopped by such a practice. Finally, this survey documents the conversion from chloride of lime to the use of liquid chlorine that was occurring during this period of water treatment history. Chloride of lime was first used on the Jersey City water supply, which started the disinfection craze (see my book, The Chlorine Revolution). However, the availability of liquid chlorine in pressurized cylinders and the ease of its application ultimately converted everyone to this newer technology. This entry was posted in Year 6 TDIWH and tagged chloride of lime, chlorine, drinking water, Jersey City, liquid chlorine, public health, The Chlorine Revolution, water, water history on August 10, 2018 by safedrinkingwaterdotcom. This entry was posted in Year 6 TDIWH and tagged chlorine, drinking water, Edwin Chadwick, Hemlock, liquid chlorine, miasma, public health, Rochester, sewage, sewers, Vincent B. Nesfield, water, water history, water supply on January 24, 2018 by safedrinkingwaterdotcom. January 11, 1922: Two fascinating articles in Engineering and Contracting about the progress of water treatment, regulations and disinfection in U.S. water supplies in 1922. Engineering and Contracting article. “Some Features of Present Water Supply Practice.” Nicholas S. Hill, Chairman. “Water Quality Standards—Standards of quality are steadily rising and bid fair to continue doing so. Communities no longer consider safety sufficient, but demand a drinking water of good appearance. This demand has good scientific foundation for the best appearing waters are frequently the safer. This entry was posted in Year 6 TDIWH and tagged B. coli, chemophobia, chlorination, color, drinking water, fear of chemicals, liquid chlorine, New England, public health, turbidity, water, water history, water quality on January 11, 2018 by safedrinkingwaterdotcom. Commentary: I am taking bets on whether or not this patent was ever commercialized. Had they known, all the three gents had to do is wait 30 years for climate change to melt icebergs for them. Is this where the phrase “patently absurd” comes from? This entry was posted in Year 6 TDIWH and tagged chlorine, drinking water, icebergs, liquid chlorine, microscope, patent, public health, van Leeuwenhoek, Vincent B. Nesfield, water, water history on October 24, 2017 by safedrinkingwaterdotcom.